In his March 7 blog post, Scott Bailey began a conversation about demographic shifts that have characterized Washington’s recession and recovery. Initially, men bore the brunt of job losses, but then saw a disproportionate return to work during the recovery. When is a flat unemployment rate good news? On March 19, we announced that Washington’s seasonally adjusted unemployment rate for February was unchanged from January, at 6.4 percent, while jobs grew by an estimated 2,500. In assessing the report, our labor economist said, “That’s a positive sign. The economy is holding its own.” Many people may wonder why it’s a good sign that the unemployment rate didn’t get better. Did you know that Washington’s grape production is second only to California? There are two origins of the state’s grape and wine industry. The earliest history of Washington wine starts with 1825 plantings of the first grape vines in Fort Vancouver, by trade workers from Hudson’s Bay Company. The second origin of started in the 1860s and 1870s, when immigrants from Germany and Italy settled in the Walla Walla area and started larger grape and wine productions. One of the most significant innovations in labor market information of the past two decades has been the development of the Local Employment Dynamics (LED) database, a joint venture of the Census Bureau and the states. LED tracks employment by age and gender for all jobs covered by unemployment insurance, with the exception of federal workers. LED employment closely aligns with Employment Security’s Quarterly Census of Employment and Wages (QCEW) data series. Recession and recovery: Employment by age and gender. 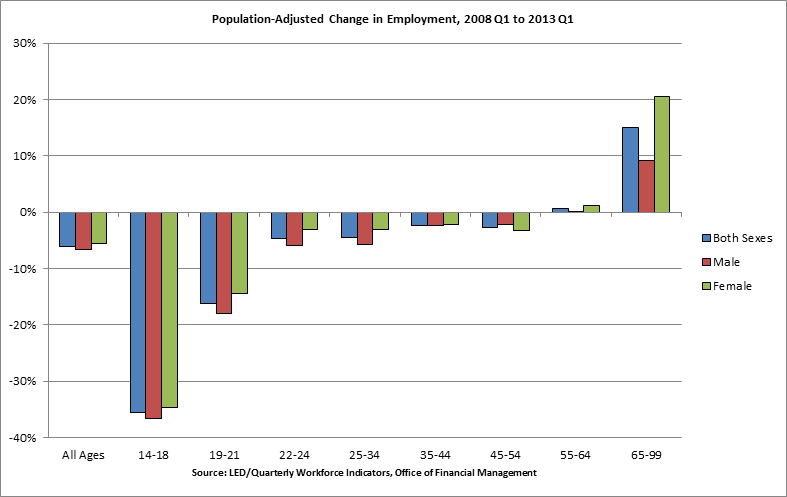 We can use LED to analyze what happened to employment by age and gender in the recent recession and recovery. The chart below looks at these changes over a five-year period, including the two years of employment decline and the first three years of the recovery. On March 5, we announced that Washington state now has more people working than before the start of the Great Recession. As with most labor-market data, there’s more to the story. Before January 2014, our data showed we’d recovered about 83 percent of our recessionary job losses. But thanks to some statistical changes (benchmarking) by the federal Bureau of Labor Statistics in January, the original estimate of 205,900 job losses was cut to 189,300. Simultaneously, the estimated job gains since the recession were revised upward by a similar amount. In an instant, the gap was erased. What does it all mean? Think of it as an important milestone during our long recovery, not a declaration of victory.